Join us for a time of joy and power. Find Freedom. Heal. Our goal is freedom. Freedom from the past, from karma, from the traps of the mind, from suffering. When we are freed from the influences of the past, we experience a true present. And from that flows healing, joy, gratitude and an unbounded future. 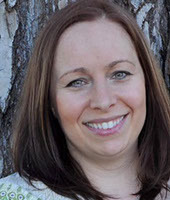 Throughout the retreat we'll use a number of powerful, guided meditations: going deep within to dissolve blockages and barriers. From healing the influence of our lineage to discharging karma and unbinding past lives, everything we need lies within us - waiting to be unlocked and activated. 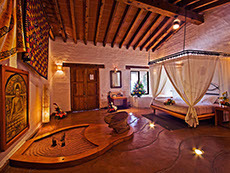 A healing and rebirthing ritual in use for thousands of years, the Temazcal is symbolic of Mother Nature’s womb. 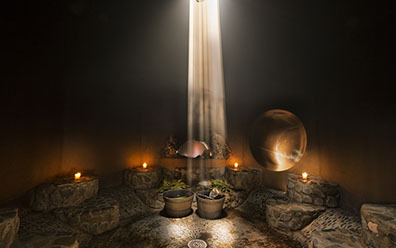 Through the use of steam and healing herbs, the Temazcal ceremony purifies the body and the spirit. 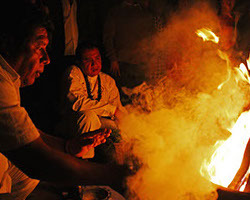 The ritual not only detoxifies our cells, under the guidance of a native Amatlan Shaman, it frees us from what no longer serves us and helps us to live a vital present. 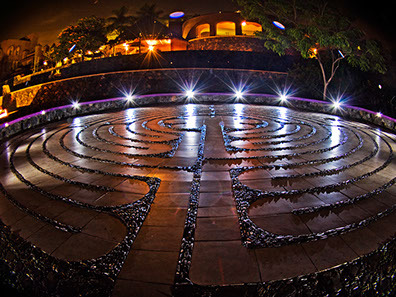 One of the oldest tools for transforming consciousness on the planet, Hostal de la Luz has an exact replica of the labyrinth at Chartres cathedral where we will begin our journey of healing. As we walk the knotted path of the labyrinth we activate our deepest wisdom - the surety of our highest selves that will guide each step of our journey. 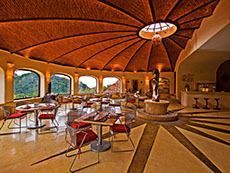 The spirit of the valley, the energy of the land the sites and the people, are important components in our transformational journey: from healing our lineage on top of the ancient pyramid, to connecting with our own past lives in a 15th century monastery or celebrating Dia de los Muertos with the local villagers, the Genius Loci of Tepoztlan is unique and powerful. 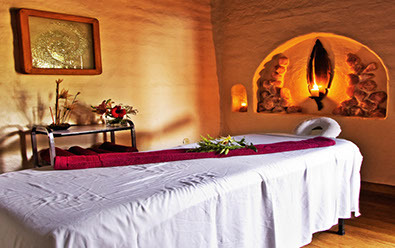 We probably don't have to convince you that a great massage is pretty central piece of a healing retreat. 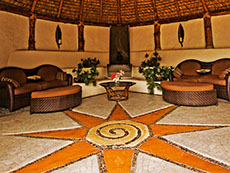 But if you do need a little persuasion, you can trust the world-class practitioners at the Spa de la Luz to turn you into a believer. Water my blood, Earth my body, Air my breath, And Fire my Blood. Dia de los Muertos - November 1&2 - celebrates the lives of the deceased with the food, drink, parties, and activities the dead enjoyed in life. Dia de los Muertos recognizes death as a natural part of the human experience, a continuum with life. On Dia de los Muertos, the dead are awakened to share celebrations with their loved ones - rather insult them with mourning or sadness, they are greeted with joy and rememberance. "This trip is like nothing I've ever experienced. The history, culture, and spiritual practices you get to participate in are out of this world! If you go on only one trip this year, let this be the one. Just can't say enough about it! 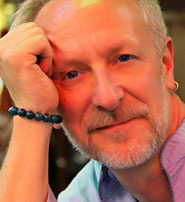 Thank you Spirit Quest for continuously raising love & awareness for your guests." 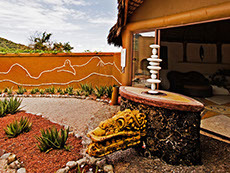 One of the world's truly unique resorts, everything about Hostal de la Luz is an exercise in conscious creation. 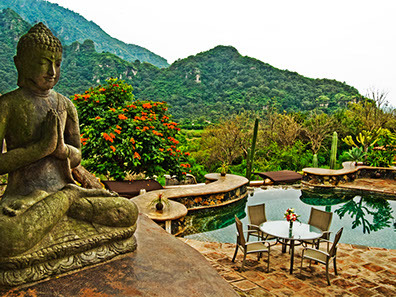 The unmatched beauty of the landscape and mountains, high Earth vibration, magic and wisdom of Amatlán, birthplace of Quetzalcoatl, combined in a unique setting: Hostal de Luz. 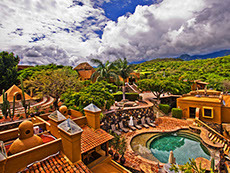 At the heart of this gorgeous resort lies a massive meteor: discovered when the property was first being developed. 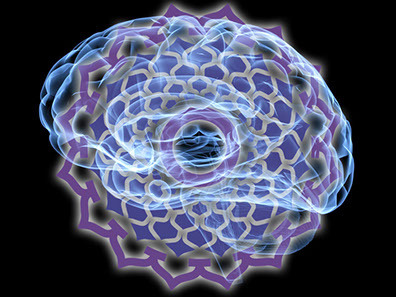 Infused with the principles of Feng Shui and Sacred Geometry, it boasts numerous powerful vortexes. 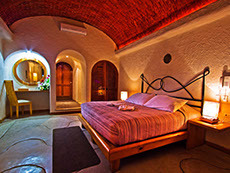 The goal of Hostal has been, since its conception, creating an oasis of peace, health, beauty and harmony, in order to help reconnect with one's true self: a spiritual being of Light. 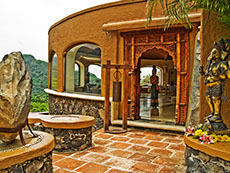 Legend holds that the sacred valley of Tepoztlan is the birthplace of Quetzalcoatl , the Feathered Serpent, the Solar Logos, venerated by the local Nahua people. In Nahuatal the name means "Wind Jewel." 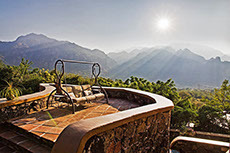 Gazing down across the valley is El Tepozteco a centuries old pyramid and shrine, nestled high in the rugged mountains that tower above the valley. 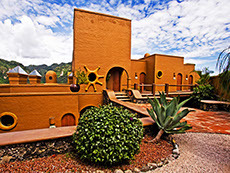 Long recognized as one of the Earth's power places, the earth energies and vortexes in Tepoztlan, fed by underground rivers, perfectly compliment the valley's rugged beauty. We happily share referrals fees! Bring a friend. Price doesn't include airfare to/from Mexico City. Space is VERY LIMITED. Sign up now to secure a spot! If you'd prefer to get a call back - please let us know your phone / Skype and the best time to reach you. In 1950 Yogananda wrote that if "if there is a scenic beauty contest, Xochimilco will get the First Prize.” Xochimilco - which means “flower field” - is all that remains of the vast system of causeways, canals, man-made islands and floating gardens created out of the huge waterway that once covered the entire Valley of Mexico City. 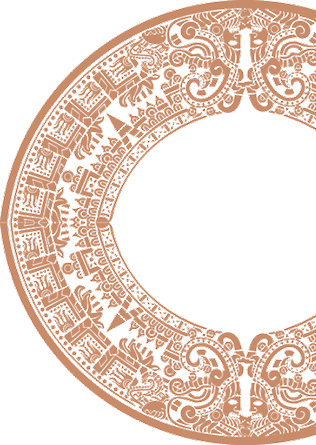 More than 1000 years old, It's a stunning feat of engineering and glimpse into the genius of an ancient civilization. 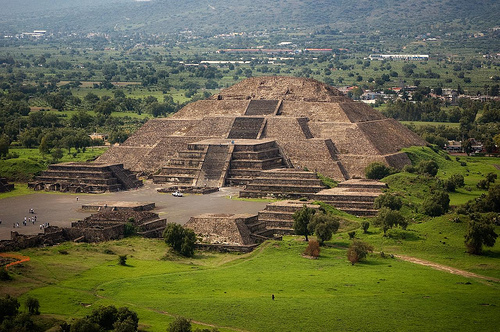 The ancients called Teotihuacan "The place where Men become Gods." 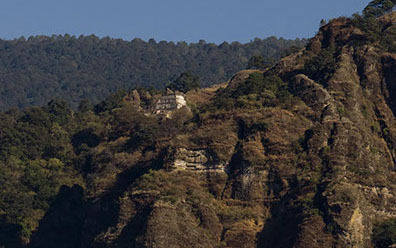 It'ss one of the largest, best preserved sacred sites in the world. 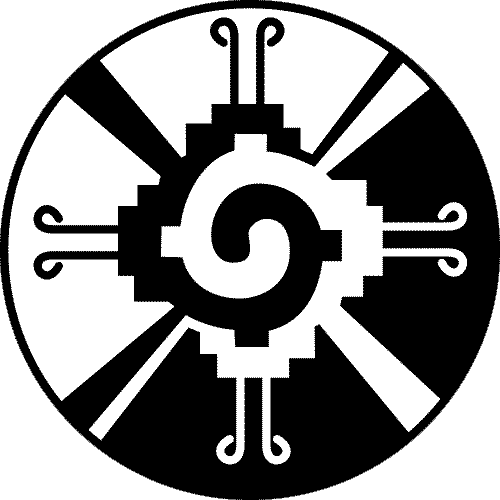 A unique place of spiritual energy, with a tradition of esoteric work by thousands of people over thousands of years. 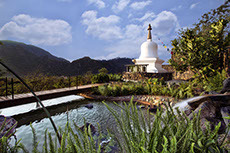 This is a place to gain inspiration and transformation like no other. We'll spend an entire day exploring it with our guide and Shaman, Victor, who was born on the grounds and who offers a deep and powerful understanding of the site. One of the world's greatest, Mexico City is a dazzling mix of ancient, modern, rough and refined: we'll go to some of its' most compelling places. 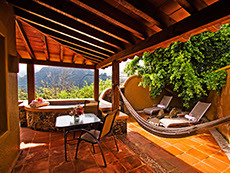 On Thursday 11/3 we’ll transfer to our gorgeous hotel - La Casona - a mansion in the heart of Colonia Roma. 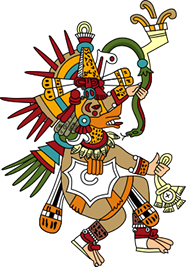 On Friday we’ll spend the entire day exploring the magnificent ancient site of Teotihuacan, guided by our friend and shaman Victor - who was born on the grounds, so "Teo” is, literally, his own back yard. On Saturday we’ll explore some of Mexico City’s most colorful and intriguing places: from gliding down the ancient waterways of Xochimilco to strolling the tree lined avenues of Coyoacán and our VIP entrance to Frieda Kahlo’s house, we’ll see a charming and unforgettable side to this world-class city. As you’d expect we’re cooking up something extra especial for our farewell dinner! Sunday, we’ll all sleep in, take it easy, and enjoy our luxurious mansion digs before heading back home.